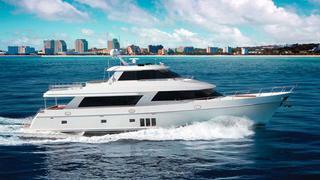 News in from Ocean Alexander of the sale of two new motor yachts to the US market. Niel Steenkamp from Ocean Alexander’s Seattle office successfully completed the the sale of the new 27.5m Ocean Alexander 90 skylounge motor yacht in Newport Beach, California. Then an outside broker, Lon McClosky, of The Marine Group in Fort Lauderdale, Florida sold a new 25m Ocean Alexander 82 Cockpit Motor Yacht.